Based in Kerala, Vacation N Holiday is one of the reputed Tour Operators and offers our clients excellent House Boat Services. 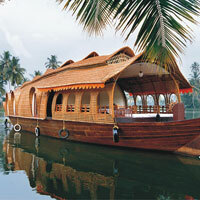 We offer two types of houseboats such as Standard Houseboat and Deluxe Houseboat to our clients. Clients who want to explore locations from different perspective can avail our services. Our houseboat cover many locations such as Cochin, Munnar, Thekkaday, Kumarakom, Kovalam, Varkala, Kanyakumari, Coorg, Wayanad, Ooty, Mysore, Rameshwaram, Trivandrum, Vagamon, Athirapally, Guruvayoor, etc. You can enjoy the good scenic view in our houseboat. Apart from the scenic view we offer many facilities to our clients such as welcome drink and traditional cuisines so that you can enjoy and feel relaxed with family and friends. We offer our services at the best prices.